In the wake of the historic 2016 presidential election, there's been a record number of female candidates seeking office nationwide. In the House alone, there are 476 women candidatesin 2018, a sharp increase from the number two years ago, OpenSecrets.org reports. While one might assume that Trump's victory inspired more women to run because they disagreed with his views, there may be another, less-obvious answer: Hillary Clinton. Though Clinton lost the election, her journey to become the first female presidential candidate ever nominated by a major party may have had a ripple effect, which could have lasting effects in this year's election. That's one theory that can be extrapolated from new University of Colorado Boulder research that was published in March in the American Journal of Political Science. 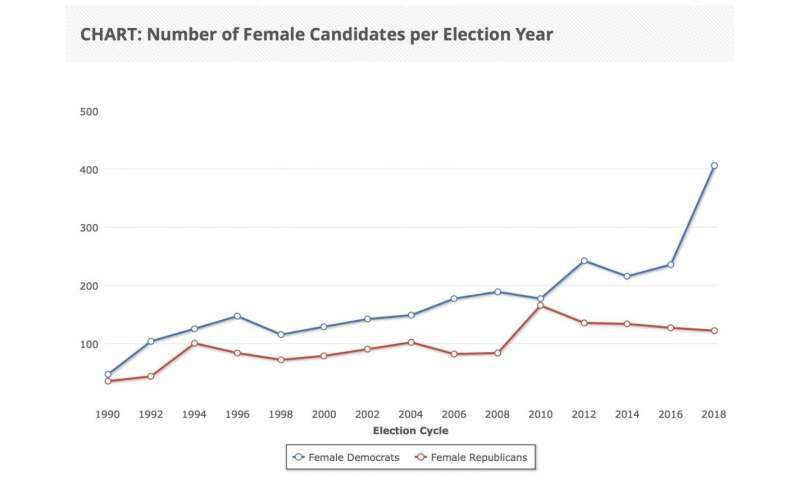 "People tend to discount the effect that Hillary Clinton probably had on the number of women running for office," said Christina Ladam, a CU Boulder political science graduate student and the study's lead author. "There's strong support for the idea that she may have served as a symbolic role model for women to think that they can do it, too." Past research has found that women fare just as well as men when they decide to run for office, but since fewer women enter political races in general, they remain underrepresented in politics. Working alongside University of Notre Dame associate professor Jeff Hardenand University of North Carolina Charlotte associate professor Jason Windett, Ladam set out to discover what motivates some women to run for office, and whether prominent female politicians could inspire other women. To answer this question, the three researchers analyzed statistics from an extensive database that tracked winning and losing political candidates from all 50 states between 1978 and 2012. More specifically, they looked at what effect having a female governor or U.S. senator in a state had on the number of women who later ran for that state's legislature. "How do we get more women to run for office? We find support for the idea that electing women to prominent offices inspires other women," Ladam said. In fact, the researchers found that, on average, the presence of a female governor or U.S. senator in a state translated to an additional seven women running for state legislature in the next election cycle. The researchers also found evidence of a so-called "legacy effect," meaning that having a female governor or U.S. senator continued to have an impact on the number of women who ran for that state's legislature in subsequent years. Even when female candidates ultimately lost the race for state governor or U.S. senator, the data showed a boost in the overall number of women running for state legislature. This finding in particular stood out to Ladam in the context of the 2016 election. "The media narrative about the number of women who are running for office this year has focused a lot on the effect of Trump," Ladam said. "But our research would suggest that Hillary Clinton really had a role to play there. She's the closest a woman has ever come to winning the presidential election, and our research would suggest that she was really able to serve as a role model for other women to see themselves as part of the political process." These initial results made the researchers want to understand exactly why more women were inclined to run for state legislative seats. They ran a series of tests to determine whether more practical factors were at play, such as increased recruiting efforts, or whether the high-profile female politicians in that state simply served as role models. One way they tried to answer this question was by looking at the impact of a female governor or U.S. senator on neighboring states, since it would be unlikely for recruitment efforts to cross state lines. They also looked at partisan differences, since a female governor or U.S. senator is unlikely to promote recruitment efforts for the opposing party. Because they also saw an increase in the number of female candidates in neighboring states and saw no major differences by party, the researchers say their study finds the most support for female candidates serving as role models to other women, though they can't rule out the possibility of recruitment efforts entirely. The real-world implications of the study are straightforward: one way to improve gender diversity in politics is to simply get more women to run for high-profile offices. "It matters not just if you are interested in campaigns but more generally about the representation of women," said Harden, who served as an assistant professor of political science at CU Boulder from 2013 to 2016 before taking up his post at Notre Dame. "Not all of these women who decided to run win, of course, but a portion of them do, and that can be consequential. It's not like having a female governor or U.S. senator is going to get a state's legislature up to 50/50 in terms of gender representation, but there is still a small boost." Ladam, Harden and Windett plan to continue this line of research by conducting case studies of individual female politicians. As for what will happen in November's midterm elections, Windett says he expects the outcomes to vary, with each state's culture and history likely playing a major role in who gets elected. "We'll wait and see, but right now it's looking promising for women being elected, regardless of partisanship," Windett said.